Photograph by Angela Doll CarlsonThere is some awful poetry in the world. There is some awful poetry just as there is some awful photography, some awful construction, and some awful cuisine. Sometimes, exposure to one awful version of a thing at just the right time can sour a person to it. My son was 8 when he turned against salmon. He’d eaten it with all kinds of gusto for a while, then one day he got a bad piece of fish. Whether it was the bones he found or the seasoning or the aftertaste or the smell I don’t know. From that point on he refused not only salmon but all fish. If fish as a food choice disappeared from the earth tomorrow, he’d be perfectly content with the loss. Poetry is like that for some people. Maybe they were forced to memorize a poem in grade school, maybe it was a fine poem at a bad moment, or maybe it was an awful poem in a good moment. For some people poetry doesn’t feel as though it matters. It has seemingly no impact, it doesn’t pay the bills, it will not clean the bathroom, it does not rake the falling leaves. For some, poetry feels like an indulgence for people with too much time or money or education. It can feel beyond most mainline folks. Why bother? It could be that poetry saved me and that is why I love it. It could be that poetry is what woke up the artist in me and that is why I pursue it, nurture it, stock my bookshelf and my coffee table with it, eat it for breakfast and just before bed. Poetry isn’t caviar to me; it’s water. My mother received her bachelor’s degree finally, after years of night classes and summer schools and studying long after we were in bed. She received her degree in music education from Mount St. Joseph College in Cincinnati, Ohio, when I was in the 8th grade. I was suffering from bronchitis or tonsillitis or conjunctivitis — some kind of “-itis” that required I stay home by myself while my family piled in the mustard yellow VW autobus to watch my mother take the stage for her diploma. When everyone returned home, my mother had a copy of the commencement speaker’s address and a copy of the speaker’s book for me. I had not heard of Nikki Giovanni before this. I had only been exposed to poetry a little in Catholic school, memorizing and reciting lines by Joyce Kilmer like “only God can make a tree” and perhaps one or two others I’d forget soon after. Nikki Giovanni’s “Cotton Candy on a Rainy Day” was the first book of poetry I owned, and I read it daily, letting the poet kidnap me, sink words into my skin, and make me a part of the poem. Good poetry does that. Good poetry can reach inside of us and draw us back into the page. Last year, a poem linked from the Facebook page of a poet friend caught my attention. It was a post of congratulations, for having one of her works placed in a well-respected journal. Because I love my friend’s poetry, I clicked the link and I read the poem, scanning the first few lines quickly because online time is slippery. Blinking lights and exciting content are what keep people reading online. Sometimes I have four or five windows open on my browser and I jog between them all, looking for the blinking lights and exciting content. Failing that, I check e-mail, write a few lines, play a quick game of Solitaire, anything to keep the boredom away. drop of water . . . I read through the poem twice, then a third time, aloud because I do that with poetry. I read it aloud in my empty living room while the kids were sitting in desks at school, while my husband was in a meeting downtown, while the rain came down outside. And I saw myself in that poem, standing still at the foot of the waterfall the poet tells us resides in Iguazu Falls, Argentina, and I shared that moment with her in that unnaturally quiet port of my otherwise stormy household. When I was a kid my mother would buy General Foods International Coffees, most likely on the advice of the commercial that instructed us all to “celebrate the moments of our lives.” The commercial was compelling because of the quiet setting, because of the sipping of the coffee, the contented looks on the faces of the coffee drinkers. The narrative was so convincing that I bought it too when I moved away from home. I trolled the aisles of the grocery store, picking out foods to stock my own pantry for the first time, choosing things my mother would not have allowed and a few things that she kept stocked for herself, celebrating the moments of her life. I didn’t care for the instant coffee once I tasted it, but I continued buying and drinking it anyway. It was the commercial I wanted. It was the quiet and the calm and the celebration. Now it’s the internet that makes the promise to fulfill us, not with calm and quiet inner celebration, but with blinking lights and constant excitement, 24-hour news cycles, and celebrity gossip. The world is still loud, still intrusive, still breaking in, and leaving a mess in our collective psyche. I suppose I am still looking for those small moments, those “General Foods International Coffees moments” to celebrate. 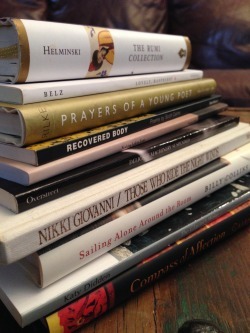 The first time I heard Billy Collins read poetry, I was in my car. NPR was doing a piece on the new poet laureate of the United States and I listened as I stared at the vast line of brake lights ahead of me on the expressway where the Stevenson meets the Dan Ryan. His unassuming voice came through the tiny speakers, reading a poem in his everyman voice, lingering over his words, his phrasing, his subtle humor interlacing each of the lines, his talk of barking dogs and handmade summer camp crafts. Months later, I twisted my ankle in the parking lot of the Nashville Public Library in an effort to hear him speak. I was running late, I stepped into a pothole. When I reached the auditorium I sat in the back, in severe pain, with my foot as elevated as I could manage in the packed-out place. It throbbed in time with his reading and once I felt so lightheaded and nauseous I had to limp from my row, down the hall, and one short flight of stairs to the ladies room. “This is what I have become,” I thought. I’m a diehard poetry groupie now and the knowledge of this made the pain bearable somehow. I bought Katy Didden’s book The Glacier’s Wake the day I read that poem online, after reading it aloud to myself in the quiet. Later that night when my husband Dave got home I read it aloud to him as well and he nodded his agreement, affirming the beauty there, the complexity, the simplicity, the words placed just so, just right. When the book came a few days later I sat reading it on the couch. My teenaged son pointed to it, “What are you reading?” I showed him the book, telling him of the poem, telling him that I’d read aloud to myself a few days earlier. He was struck. “You liked it enough to buy the whole book?” he asked. It could be that poetry saved me and that is why I love it. Poetry made sense of my parents’ divorce: words of Anne Sexton and Sylvia Plath eased the transition. Poetry made sense of my awkward adolescent years and my awkward college years and my awkward grown-up years. Words written by Keats and Hugo and Poe crept into me when I was broken and weeping. Poetry made sense of my miscarriages and my faltering faith in organized religion as Luci Shaw and Ranier Maria Rilke bound me in the warm blanket of verse. Poetry gave words to deep troubled waters that flowed around my arms and legs; it buoyed me when my head was too tired to hold up. It whispered Emily Dickinson’s words to me when I was alone, “I’m nobody! Who are you?” and it shouted Ezra Pound, “Tree you are, / Moss you are.” Poetry uttered E. E. Cummings at just the right moment: “She, being brand new” and I unfolded from myself and let the light from it find all of my edges. Poetry will never buy me bread or pay my rent. It will never pick up my children from school when I’m sick. It will not offer me a ride to the airport. Poetry will slip from my memory when I am old, phrases long memorized will most likely be buried under medical bills and compression hose and even so it will not forsake me completely. It will live deep in my cells, deep in my breath, deep in my history, and my making. It will buoy me when the water rises, when the dark falls, holding me with unseen hands, the memory of years past; words placed like pillars long forgotten. My world is busy and complicated and strange, my body is aging and needy yet poetry matters, even now. Angela Doll Carlson is a poet and essayist whose work has appeared most recently in publications both online and offline, such as Burnside Writer's Collective, St. Katherine Review, Image Journal's Good Letters blog, Ruminate Magazine Blog and the Art House America Blog. Her first book, Nearly Orthodox: On Being a Modern Woman in an Ancient Tradition is due out from Ancient Faith Press in Summer 2014.